I crave asparagus during pregnancy, and for good reason! It's extremely high in vitamin K, folate, and vitamin A — all of which our bodies need when we're growing a new life in the womb. Did you know that the root of an asparagus can go as deep as 15 feet into the ground? Because of its deep-reaching roots, asparagus is very high in minerals which — with our depleted food system and barren soils — we almost never get enough of. So asparagus is brain food, pure and simple! And its season — March through May — is almost upon us! Of all the hundreds of ways to prepare asparagus, my favorite way is roasted. I hope asparagus graces your table often! Pat asparagus dry and place on a baking sheet. 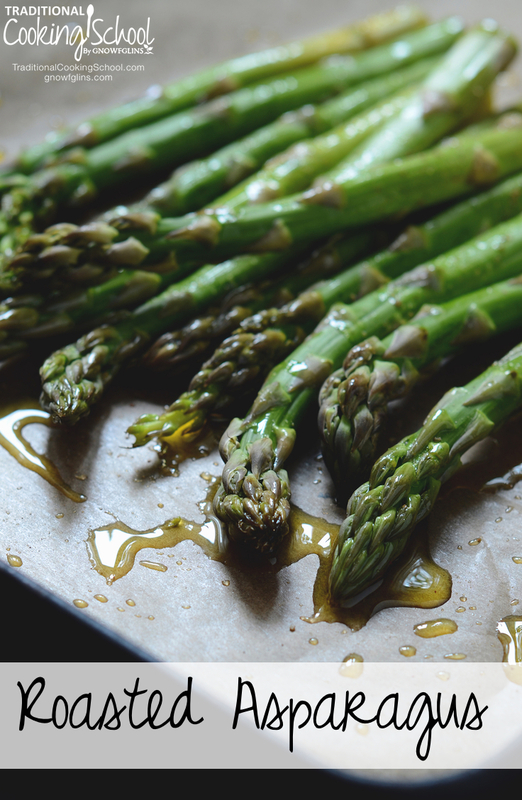 Liberally drizzle olive oil over asparagus shoots, then gently with your hand roll the shoots back and forth across the baking sheet until each shoot is coated in oil. Liberally sprinkle the asparagus with salt. Kosher is preferred over fine salt because the coarse granules give each shoot a better flavor and texture once roasted. For thinner shoots, bake for 10 minutes. For thicker shoots, bake for 15 minutes. Serve hot. Do you love asparagus? What's your favorite way to prepare it? I like to use a splash of sesame oil too &/or sprinkle sesame seeds over them before roasting. Sometimes I’ll do olive oil & balsamic vinegar mixed together too. Carrie, what a great idea! I’ll be trying the sesame seeds with the asparagus I just bought. We love roasted asparagus! I like to roast it and then eat it cold like a marinated vegetable. Thanks Katie! This looks really good. I look forward to trying it soon. I hate to comment negatively on blogs, but I have to state that your first sentence is false. Asparagus is not high in Vit. A. It is high in the carotenes that can be made into Vit. A, but it is not true vit. A. True vit. A can only begotten from animal sources. I know this is not something that is commonly known as our wonderful government allows it to be labeled that way, but if you get a Merck manual, it will tell you the truth. We like asparagus this way also, but finish it off by sprinkling Parmesan cheese on it. Yum! I use coconut oil bec. of the heat. Alton Brown’s idea of adding zest of medium lemon with 1/2 t. of grated nutmeg takes asparagus to a heavenly level. My favorite way is to steam the asparagus and then pour browned butter and Parmesan cheese over them. It also works as a diuretic and anything dark green is a detoxifier in my opinion. I love asparagus!